It is necessary to test the solids content of your solder flux on a regular basis. Keeping the solids content in line with manufacturers specifications will provide proper wetting and bright shiny solder joints.Testing on water soluble fluxes is usually performed with a Hydrometer and on no-clean fluxes with a titration kit. The LSH-1 Hydrometer is handmade with precision and durability. The LSH-1 Low Solids Hydrometer has a clear, easy reading scale and is frequently used for the service industry. The Hydrometer's Float has a specific gravity scale range ( 0.750 - 0.850 Sp. Gr.). The Barrel is a Step-Down type glass tube. These tubes are well annealed, 100% free of strains and are always correctly propotioned. 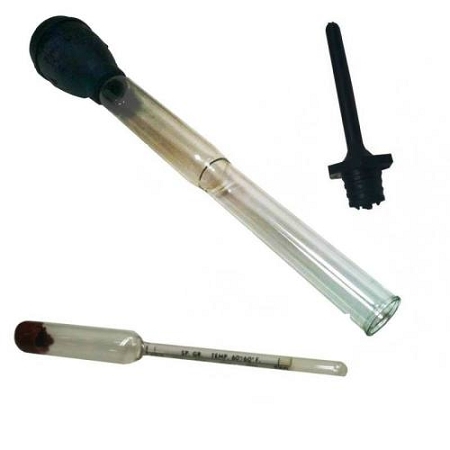 The LSH-1 Hydrometer is equipped with a rubber bulb and end piece. Both the Bulb and End Piece are constructed from the highest grade of acid-resistant rubber. The End Piece is a 3" long tube built with a square flange to prevent rolling around. The LSH-1 Hydrometer has an overall assembled length measurement of 18".